Perhaps the ultimate in TV comedy madness and absurdity, this cult series, which began in 1969, was conceived, written, and performed by Graham Chapman, Eric Idle, Michael Palin, Terry Gilliam, and Terry Jones. Its innovative and ground-breaking comedy inspired many of today's writers and performers. This audio programme features many of the legendary sketches, songs, and catchphrases, including "The Dead Parrot", "The Ministry of Silly Walks", "The Lumberjack Song", "And Now for Something Completely Different", and many more. Children of the '70s, rejoice! This is the album you remember listening to over and over with your friends (and in my case, with my sophisticated New York cousins, who introduced me to everything funny and cool, Python included), laughing hysterically. You definitely need to own this walk down memory lane to a simpler, sillier time. It's all here: Crunchy Frog, Dead Parrot, the works, lightly killed, and lovingly frosted with glucose. it even ends with a bang, which I'd forgotten. Thank you, Audible, for making this modern classic available! Ever wondered why fans can't resist quoting lines from Monty Python skits? They cackle something absurd and then break into fits of laughter leaving the uninitiated clueless? I had this recording on a cassette tape when I was a kid. I played it so often it became stretched and unplayable. Today I was reunited with a recording that is a Monty Python classic. The Flying Circus is a great place to plug into the absurd, mind bending British humour and be introduced to their whacky world perspective. Before you know it you will be cackling absurd lines and laughing out loud before you finish leaving others wondering what's going on. They really do 'shine out like a shaft of gold while all around is dark'. 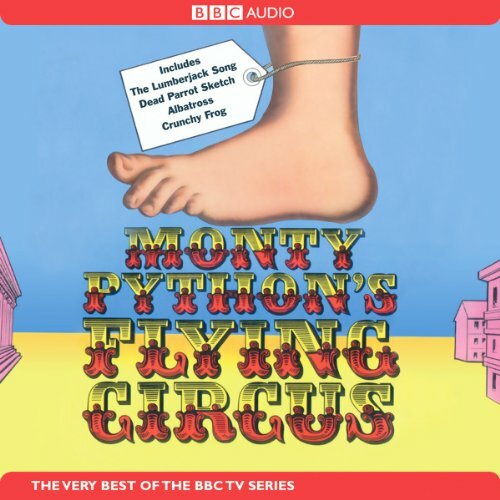 Where does Monty Python's Flying Circus rank among all the audiobooks you?? ?ve listened to so far? Not an audiobook. This is classic Python sketch comedy! What other book might you compare Monty Python's Flying Circus to and why? Have you listened to any of the narrator?? ?s other performances before? How does this one compare? a nods as good as a wink to a blind man! nudge, nudge, wink, wink!! !.